aliencuriosity | Did aliens visit ancient civilizations? Did aliens visit ancient civilizations? There are three ways to search for possible evidence of intelligent aliens visiting earth. I’m not saying that extraterrestrials have visited earth. I’m not saying that they haven’t. With over 100 billion stars in our Milky Way galaxy, and with an estimated over 100 billion galaxies in the universe, with many of those stars much older than our sun, it seems statistically favorable for intelligent extraterrestrial life to visit earth, in the past, present, or future. So I’m curious: Have extraterrestrials visited earth in the past? Are they visiting in the present? If so, perhaps there is some evidence of this visitation. The premise of the scientific method is open-mindedness. This means not being closed-minded about the possibility of extraterrestrial visitations. It also means not being sure that there is extraterrestrial life. I’m starting out with: “I don’t know. Let’s try to find out.” Let the evidence, if there is any, dictate possible conclusions. In addition to remaining objective, it’s also important to proceed with logic and reason, to search for evidence, and to devise possible experiments to test hypotheses. Science is based on experimental evidence. Even the most revered laws of science remain valid if and only if they continue to be supported by experiment. Unfortunately, mainstream science isn’t always objective about every topic, and isn’t always supportive with regard to certain topics, and aliens may be one of them. However, there are many highly regarded scientists from the past who expressed strong interests in possible extraterrestrial life. So let me be clear that I’m not doing official research. I’m not out in the field doing firsthand research. What I want to do is follow my curiosity, study what work has been done, and see where it leads. There is a wealth of ufology out there. Certain kinds, such as ancient astronaut theory, is gaining strong popularity, not necessarily within mainstream science, but at least among large numbers of curious individuals. My interest is to consider many of these popular topics, and see if any of it seems conclusive one way or the other. Again, I don’t expect to find any smoking guns of a definite yes. I’m trying not to have a preconceived expectation. I want to examine what’s out there and see if any conclusions can be drawn. It may be that the best that can be done is find some evidence that seems plausible, but not convincing. But maybe some evidence is convincing. Or maybe some so-called evidence is clearly incorrect. If you don’t feel that you ‘know’ what the outcome will be, then you have a scientific perspective. Then the trick is not to be too quick to let evidence—for or against—pull you along, but to resist the evidence and force it to convince you with logic and reason. Ancient astronaut theorists have made a popular case that archaeological artifacts, perhaps along with other types of evidence, may provide evidence of ancient aliens. I’m not saying it does. I’m not saying it doesn’t. I’m thinking, let’s explore it. There certainly are some fascinating archaeological wonders from ancient times. Does mainstream science explain these wonders adequately? I don’t know offhand. I’m curious. A great thing about archaeological artifacts is that there is actual physical evidence (at least, physical remains—sometimes important parts may have been lost or deteriorated). Now whether or not the evidence favors mainstream science, extraterrestrials, something all together different, or maybe it doesn’t favor any of these, that’s the question. But there are actual physical objects that can be studied (with limitations—you can’t just grab a block from one of the pyramids and bring it to your laboratory to study). And while some people may disagree about how the artifacts came to be or what they mean, you can’t question (can you?) whether or not the great pyramids of Egypt or the ruins of Puma Punku, for example, actually exist and what they look like now. That’s one advantage that archaeological traces have over reports or sightings and over mythologies and historical accounts: There is something physical in plain sight that we can all agree exists. With reports and historical accounts or mythologies, the objects and events described are often called into question. If you could shake hands with an alien, that would seem convincing, wouldn’t it? Or if a spaceship landed on the White House lawn, extraterrestrials came out, and this was televised and broadcast worldwide. Even if you see a ufo, see an alien, or meet an alien, that only convinces you. As soon as you tell somebody else about your experience, you may find that what convinces you doesn’t so easily convince others. Some people don’t even believe that humans have landed on the moon. Imagine what it would take to convince people that you’ve seen a ufo. And then there are some known ufo hoaxes, which make it difficult to believe reports of ufo sightings or alien contact. Pictures can be easily PhotoShopped. In some cases, PhotoShopping is obvious, but in others, it’s hard to tell. Stories and reports can be fabricated. And even if you have excellent evidence, the government could cover it up or confiscate the evidence. But conspiracy theories don’t help you come up with convincing evidence. If we could get our hands on an extraterrestrial and show him or her (or maybe we need another pronoun) to the world, that would be a smoking gun. Or if we could find an extraterrestrial spaceship. But then proving that it’s extraterrestrial in origin is difficult. 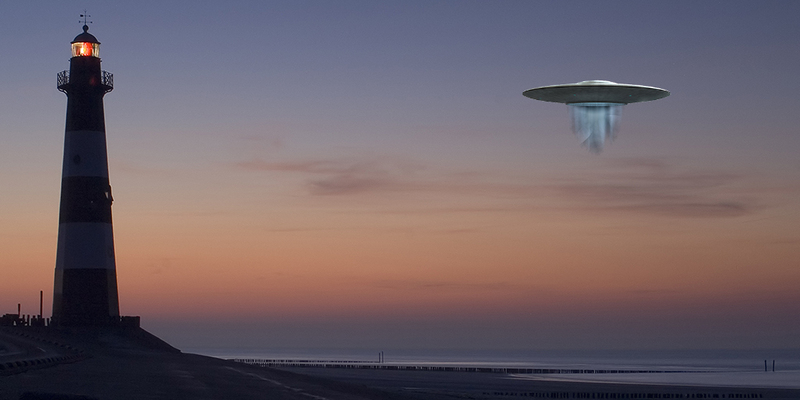 So while it seems like seeing a ufo or an alien firsthand would offer convincing evidence, unless everybody sees it firsthand, it may not be so easy. Maybe there is a report that can provide helpful or even fairly convincing evidence. Let’s be open-minded. But I’m trying to think through the three kinds of possible evidence, not to rule one out, but to help decide which to explore first. A report may also be able to help corroborate other forms of possible evidence. I remember when I first heard ancient astronaut theorists interpreting the Bible, other religious texts, and even Greek and Viking mythologies as possible historical accounts. My initial reaction was not to take it seriously, and that doing so may negatively offset some of the archaeological evidence that they were discussing as possible evidence of intelligent extraterrestrials having visited earth in the past. But let me go back to something I said earlier: To dismiss this out of hand isn’t scientific. I should begin with an open mind, see where logic, reason, and possible evidence or experiments lead. I’m not saying it will lead anywhere. It might lead nowhere very quickly. I’m just saying to bother looking where it leads rather than assume it leads nowhere. A big word here is ‘evidence.’ Just the mythological or historical accounts themselves won’t provide hard evidence. But sometimes, a historical account can be corroborated by archaeological evidence. So, trying to be open-minded, it seems possible for mythological or historical accounts to work together with other kinds of possible evidence. Along with being objective, it’s also important to be careful. You don’t want to start to assume that every mythological, Biblical, religious, or historical story is true. We can’t assume that everything we read in modern times is true, so why should it be different in ancient times? We have to be careful trying to interpret ancient records, sorting out fact from fiction and multiple possible interpretations. But it may be possible to corroborate some stories with archaeological evidence. If so, I don’t want to overlook that opportunity because I had dismissed this out of hand. My future posts will explore a variety of possible evidence for intelligent extraterrestrial visitors to earth. I will first look at a variety of archaeological artifacts. Images from ShutterStock. Space Age font from mickeyavenue.com/fonts/spaceage/license.php. With regard to possible extraterrestrial life in the universe, physicists Enrico Fermi and Michael H. Hart raised the question, “Where is everybody?” [Ref. 1]. This is known as the Fermi paradox. Our sun is an average star. The Milky Way galaxy in which we live is a spiral galaxy consisting of over one hundred billion (100,000,000,000) stars [Ref. 2]. Our galaxy is just an average-sized spiral galaxy. Astronomers estimate that there are over a hundred billion galaxies, with approximately a septillion (1,000,000,000,000,000,000,000,000; that’s 24 zeroes!) in the universe. Our sun is relatively young. It’s about 5 billion years old. Scientists believe our universe to be about 14 billions years old. It seems like there are too many stars in the universe for intelligent life not to form on many other planets. Even if the speed of interstellar travel is small compared to the speed of light, and even with the several millions of years needed for intelligent life to develop in a favorable solar system, it has been estimated that a galaxy can be colonized in a timescale on the order of tens of millions of years (which pales in comparison to the age of the universe). But if aliens have colonized the galaxy, where are they? Statistically, it seems likely that extraterrestrial life should have colonized the galaxy, including visits to earth. Several possible solutions to Fermi’s paradox have been proposed. The conditions by which life developed on earth are extremely rare, so much so that extraterrestrials have not yet colonized our galaxy. Aliens have indeed visited earth, but either our governments or the extraterrestrials themselves have prevented this from becoming widespread knowledge. One possibility is that intelligent life is so rare that despite the huge number of stars in the universe, intelligent life is unique to earth or at least extremely rare. The Great Filter [Ref. 5]. Perhaps intelligent life tends to be very short-lived, running out of needed resources, suffering from overpopulation, meeting with natural disasters or diseases, or destroying itself through wars or apocalyptic weapons. Rare Earth Hypothesis [Ref. 6]. This hypothesis rejects the mediocrity principle, stating that the conditions for life on earth are quite atypical. Earth has a significant axis tilt (23.5º), a very large moon, a favorable distance to the sun, a favorable atmosphere, a moon the right distance from earth to produce significant tidal effects, etc. On top of the astronomical and geological requirements, the conditions also need to be favorable for the biology, and even under favorable conditions it might be rare for life to begin and for intelligent life to develop. Another possibility is that aliens have indeed visited planet earth, but this knowledge hasn’t become widely publicized. Zoo hypothesis. The earth might be a galactic zoo or park, for example. Just as we have national parks to preserve wildlife, the earth might be such a planetary reservation. This might be to allow earth the opportunity to continue its natural development. Government cover-up. Perhaps governments are either aware of extraterrestrial visitors to earth or are actually in contact with aliens, but have covered this up from the general public. Lack of interest. They may be too busy with other affairs, or too different from us, to have any interest in contacting humans on earth. Too advanced. Aliens who can visit earth may be so far advanced in comparison to humans that they don’t consider it worthwhile to establish contact with us, or perhaps they fear that sharing technology at this stage in human development could threaten life on earth (we might not be ready for a sudden improvement in technology). They might be as far advanced compared to humans as humans are advanced compared to monkeys, for example. Irreconcilable differences. They may be drastically different from us, making communication very challenging or not worth the effort. Even on earth, we see great diversity in life forms. Intelligent extraterrestrial life that may be able to visit earth or at least communicate via long distance may be as different to us as a giraffe is to a fish. Here undetected. 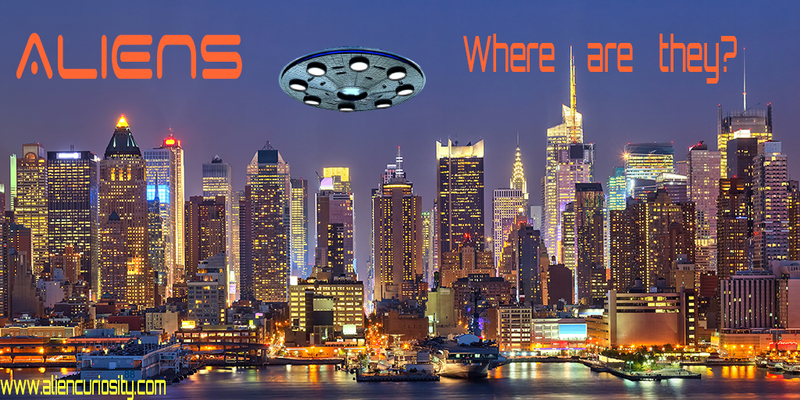 Aliens may be visiting earth, or even present on earth, but keeping themselves fairly undetected. The Ancient Aliens series on the History Channel has recently popularized ancient astronaut theory. Ancient astronaut theory and its growing popularity can be traced back to Erich von Däniken, author of Chariots of the Gods? [Ref. 7] which raises several questions about ancient civilizations, for which mainstream science may not have a convincing explanation. Maybe aliens have visited earth in the distant past, and maybe there is evidence to show this. Ancient astronaut theory even raises the question of whether or not modern day humans may be in some way extraterrestrial, e.g. perhaps ancient aliens had a hand in genetic development. This idea intrigues me. In future articles, I will be searching for possible evidence of ancient aliens here on earth. “Where is everybody?” An account of Fermi’s question. Jones, E.M., 1985. “How many stars are in the Milky Way?” Howell, Elizabeth, 2014. “How many stars are there in the universe?” Cane, Fraser, 2013. “Looking back to the cradle of our universe,” JPL, 2014. “The Great Filter—are we almost past it?” Hanson, Robin, 1998. Rare Earth: Why Complex Life is Uncommon in the Universe, Ward, Peter D. and Brownlee, Donald, 2003. Chariots of the Gods, Däniken, Erich von, 1999. Trying to contact me? Click on the photo above. Click the image to visit my self-publishing blog. Click the image to visit my math blog. The text and images of this blog are copyrighted by Chris McMullen, except where otherwise noted. All rights are reserved. The header and background images are from ShutterStock.